Buried deep in the California sand, about 150 miles from Hollywood, is one of the film industry’s strangest legends. It began 95 years ago, when the director Cecil B. DeMille chose a remote dune ecosystem near the sleepy Central Coast town of Guadalupe to stage his silent epic "The Ten Commandments." 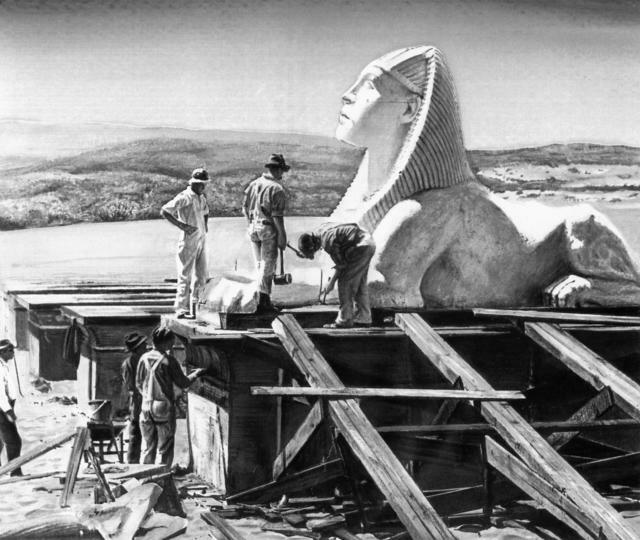 For the set, he conscripted more than 1,500 laborers to erect the most elaborate set of its day, a colossal plaster replica of ancient Egypt. It included a temple roughly 800 feet wide and 12 stories high flanked by giant statues of the Pharaoh Ramses II. An avenue lined with more than 20 sphinxes, each weighing five tons, led to the temple gates. A tent city went up near the set — staffed by military doctors and 125 cooks — to accommodate a cast of thousands of actors and animals. 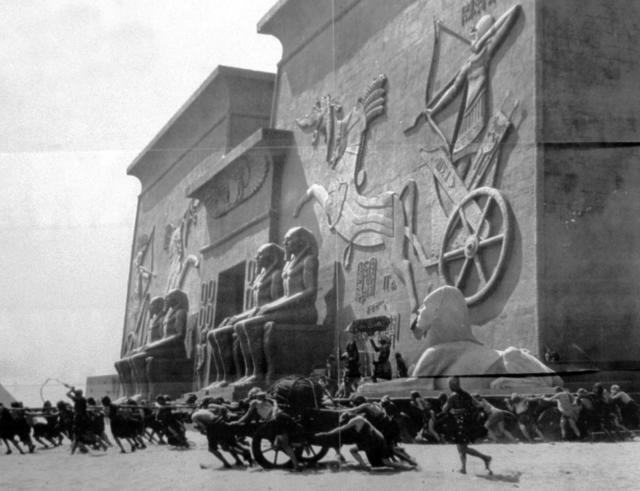 A scene from Cecil B. DeMille's 1923 epic "The Ten Commandments." Then, for reasons unknown, rather than remove his “City of the Pharaohs” as he had promised, DeMille had it toppled and covered with sand. Historians speculate that he did it to prevent other directors from reusing the set, or just to save money. DeMille later wrote, "If, a thousand years from now, archaeologists happen to dig beneath the sands of Guadalupe, I hope that they will not rush into print with the amazing news that Egyptian civilization, far from being confined to the valley of the Nile, extended all the way to the Pacific Coast of North America." Neil Rhodes, an archaeologist, used a straw to clear away sand from a sphinx's headdress. As it happened, the rediscovery came sooner. 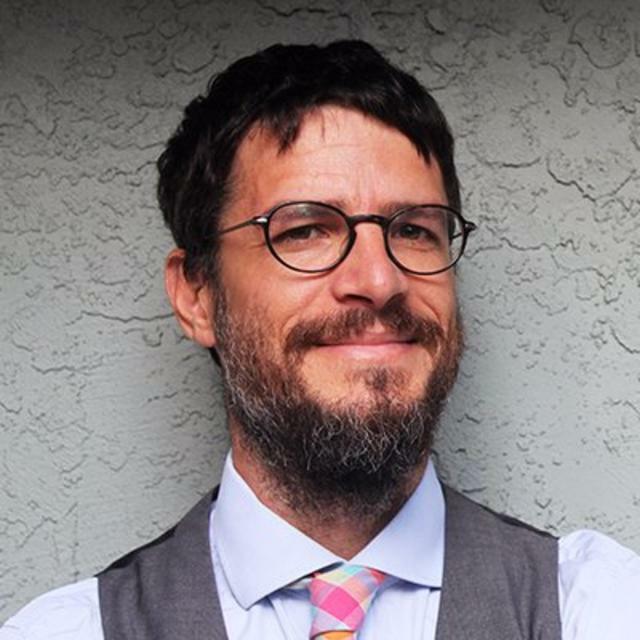 In the early 1980s, a film buff named Peter Brosnan heard the story of the so-called Lost City of DeMille. Enthralled, he studied clues of its whereabouts and pinpointed the buried set in 1983, prompting headlines worldwide. Interest spread, and digs like no other were organized as professional archaeologists sifted through the California sand for phony Egyptian relics. They weren’t only after chunks of plaster and concrete. Also entombed were emblems of daily life from the prohibition-era 1920s, including tobacco tins and bottles of cough syrup once used to sneak sips of alcohol. Still, the effort to unlock the secrets of the Guadalupe dunes was fitful. Funders showed little interest, and regulators were reluctant to allow digs in the sensitive wildlife area. Some critics questioned the historical significance of the old set. 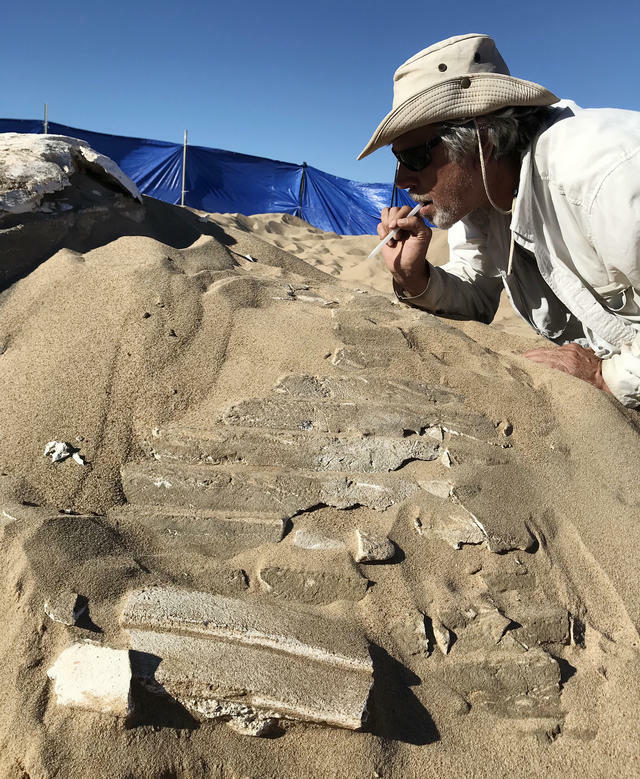 In recent years, excavations at the dunes have picked up, yielding a small trove of treasures that includes a lion’s paw, a pharaoh’s head, and cryptic wooden hieroglyphs. 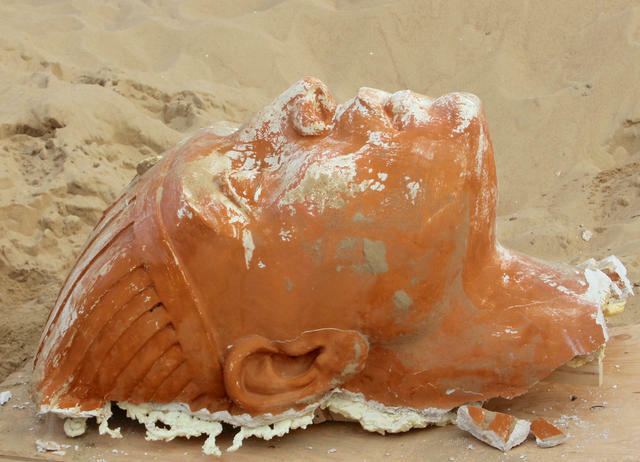 A plaster sphinx head was found during a 2017 excavation of the buried movie set at the Guadalupe-Nipomo Dunes. The latest discovery was announced in November: a sphinx with a nearly fully intact head. A small museum in Guadalupe is hosting a party this Saturday to show it off. The odyssey to recover the rest of the set isn’t over. But time is an enemy. As the years pass, more treasures are lost, ground into dust and mixed into the earth like so many past civilizations.